9 Things We Learned at "The Artistry of Outlander"
As Emmy season heats up, the Starz original series Outlander laid out a strong case for its costumes and set design categories last week with the opening of the exhibition, “The Artistry of Outlander,” at The Paley Center for Media in Beverly Hills. Cast and creatives from the show, including actors Caitriona Balfe (Claire), Sam Heughan (Jamie), costume designer Terry Dresbach, production designer Jon Gary Steele and executive producers Maril Davis and Ronald D. Moore (who happens to be Dresbach’s husband), attended the exhibition preview. All were in attendance to celebrate the gorgeous costumes and elaborate sets, and to talk about recreating 18th century Parisian society for the show’s second season. Unlike the more straightforward costume dramas or period pieces on television, Outlander blends the genres of sci-fi, romance and history, following a British nurse and World War II veteran (Balfe) as she accidentally travels back in time from the 1940s to the 1740s in Scotland and Paris. Instead of delving into a singular time period and setting, the show focuses on a multiplicity of eras and characters, which is a challenge for all those involved. 1. 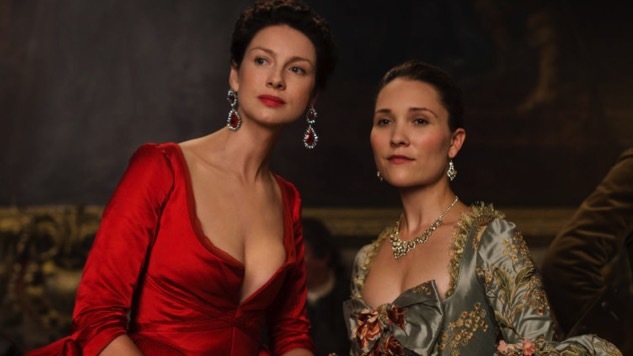 The red dress might be a fan favorite, but both Dresbach and Balfe have an affinity for another. 2. Dresbach’s team created a staggering number of garments this season. “We made 10,000 garments this season,” Dresbach said. “That’s everything from a hat to a gown.” She went on to explain that Balfe alone had 30 gowns in the first six episodes, and the Comte St. Germain (Stanley Weber), a supporting character, had 15 costumes. “So when you multiply those by two months [to create them], it was not the most fun period of time.” She had nothing but praise for her young, and somewhat green, team who shared her commitment to historical authenticity. “The untold story of this season is the craftsmanship,” she said, pointing to a number of the costumes that were hand-painted for the show. “We have about 10 people of a staff of 70 who’ve worked in film and television before.” They brought in theater artists, sculptors, painters and translated their skills into costume design and creation. 3. Fight scenes aren’t costume designers’ favorites. 4. Dresbach designs a lot of shoes. 5. Master Raymond’s coat tells a story. 7. Sam Heughan has a love/hate/love relationship with the brothel. “Set-wise, the brothel is incredible,” Heughan told us during the exhibition. “I actually grew to hate the brothel, because—it’s magnificent—however we were shooting there in the studio in the summer, and actually for the first time in Scotland, it was hot. And we were boiling. 9. Reusing and recycling sets. Outlander ’s second season currently airs Saturday nights on Starz. The Artistry of Outlander is on view at the Paley Center through August 14. Admission is free.